You’ve tried crappy content mills, online job boards, and even cold emailing – but you’re still struggling to bring in more clients. If you’re trying to jump into full-time freelancing, building a solid client base can be a steep challenge to overcome. Constantly pitching to job boards can help, but relying on these tends to be unsustainable due to the constant effort it requires on your part. If you’re trying to jump into full-time freelance writing, building a solid client base can be a steep challenge to overcome. Cold emailing is often an effective method to gain clients as well, since you are pitching directly to clients and avoiding the competition. But have you considered taking steps to bring the clients directly to you by growing your email list? If so, you probably need a lead magnet. As an example, check out Elna Cain’s offer – the header clearly displays a free email course in exchange for an email address. Several businesses choose to grow their online presence – and their email list – with all sorts of lead magnets tailored to their ideal client. For one, email has a massive return on investment – for every dollar spent on email marketing, the average return is 38$. Plus, according to this survey from 2016, 80% of responders said email helped their business drive customer retention. An email list is a direct contact with prospective clients. By signing up to receive emails from you, they let you know they are interested in what you have to say (and write!). The potential for developing a dialogue is already there. Basically, just by signing up to receive a freebie – your lead magnet – and become a part of your email list, your leads become warm. This does not by any means replace cold pitching! However, growing your email list provides a new channel to generate leads. And let’s face it – you can’t have too many of those! First off, your clients are probably already overloaded with email. The last thing they want is to sign up for an email list with nothing in return. Even if you’ve never written a lead magnet before, you can leverage your previous writing experience to create a great piece that will help you attract the type of client you want. What pain points does your client suffer from? What are your client’s goals and motivations? Does your client have any hobbies? If so, what are they? For example, let’s say your niche is Software as a Service, and that you are targeting CEOs of startups in this industry. This is just one example, but I encourage you to practice this exercise with your own ideal client! Let’s take, for example, a widely popular example – the short eBook/PDF. This type of content provides instant value to your lead – it is also fairly easy to create if you already know how to blog. However, the email course provides short bursts of value over several days. This means your lead may not get instant gratification in exchange for their email, but they will be constantly engaged for the duration of the course. On the other hand, something like a ROI calculator can be a great lead converter – but unless you know how to program one yourself, you will need to outsource the work. Do you offer social media services as well as freelance writing? Maybe a social media schedule template could be a good freebie. What about a checklist that every business in your niche needs to create great online content? No matter which option you choose, always make sure your content does the following: provide value to your prospective client and relate to the services you offer. If not, consider going with another type of lead magnet. So you’ve chosen your subject and type of lead magnet – now let’s write this thing! If you are writing a type of content you’ve never tackled before, look for online resources to help you get started. This blog already has great articles on content like white papers and publishing eBooks. Research top-performing articles in your niche and see if someone is already giving an email course on the subject – if not, be the first, and if yes, create a better one! After writing your first draft, do as you would with a blog post and let it rest for a while. Come back to it later – wait a full day at least – and look at it with fresh eyes. Cut the fluff, rearrange your sentences, correct your spelling and grammar – the usual. Make sure your content is a unique, valuable representation of your business. Because this will be a central piece for your writing business, go the extra mile and get it checked by someone else. If you can afford it, get an editor to review it for you. Remember, you are not giving this ‘freebie’ for free. Rather, you are making a trade with your prospects in exchange for their personal information. Although I recommend you make every piece of content as polished and outstanding as you possibly can, it’s especially important to make your lead magnet stand out in terms of quality. There are two ways you can go here: design the lead magnet yourself or hire someone to do it for you. If you can afford it, hiring someone you trust is a better solution, since this piece will be central to your business. However, if hiring someone is not a possibility, you can use a simple tool like Canva to create a simple design. The key here is simplicity. If you’re not a great designer, don’t try to go overboard – you risk going in over your head. Stay simple and research other lead magnets in your niche. Inspire yourself from them, but always give it a personal twist. Whether you decide to follow up the download of the lead magnet with an email chain or not, make sure to at least provide one email to welcome people in your list. The goal of this email is to onboard the prospect and open a dialogue. Tell them a bit more about the purpose of the lead magnet and the ways in which the content will help their business. You can even introduce yourself a bit. But most importantly of all, thank them for reading your content. This person deliberately chose to download something of yours – show them you value their time. Congrats! You now have a lead magnet ready to be used to funnel more prospects towards your business. To build your mailing list, you’ll need a software that handles list-building and other features like email sequencers. If you’re starting for free, MailChimp and MailerLite both have free options to start with. If you’re looking for something a little more robust, you may want to look into premium options like Drip and Convertkit. Here’s a more in-depth post comparing MailChimp, Convertkit and Drip! This article from Blogging Wizard provides a great overview of the best plugins available on the market right now. If you are directing your prospects through an ad or social media post, you’ll need an effective, distraction-free landing page dedicated to your lead magnet. Avoid creating a regular page on your website – one that contains a menu and sidebars – because you want your landing page to be distraction-free. The last thing you want is for your prospect to click away to another section of your website before getting a chance to fill in the opt-in form! For something as simple as a free opt-in, I suggest using a free service, but if you intend on using landing pages for other services or products for your freelance business, consider looking at the premium tools to see which one will scale best for your needs. If your goal is to keep overhead prices as low as possible, I suggest using MailerLite, since it provides all three features in their free option. But make sure to look into all available options and decide for yourself which one is best in your case! No matter your writing experience, there are ways you can leverage your knowledge into a great lead magnet. 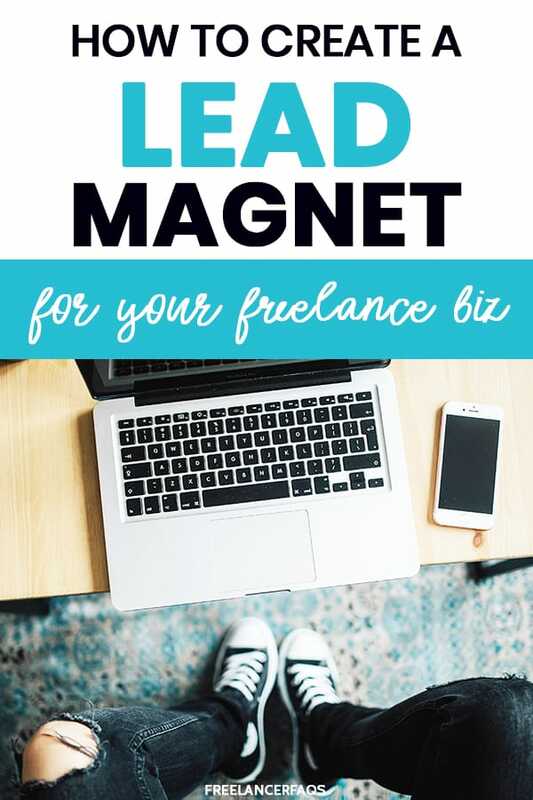 When planned appropriately and used efficiently, lead magnets can become a new pillar of your freelance writing business. However, don’t make the mistake of setting it up and stopping your outreach work completely! Your mailing list won’t magically grow if you don’t share your work by other means – social media, guest posting, paid promotions – and chances are you will still need to keep cold pitching to generate a constant stream of high-paying clients. Are you using a lead magnet to generate leads? What type of freebie would you want to offer? Let me know in the comments!